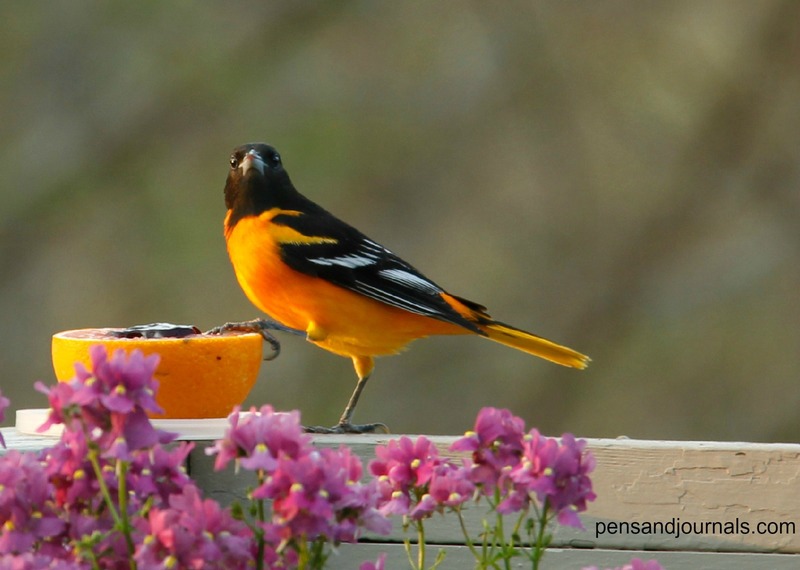 I put my pen to journal and begin to write, I see an oriole outside my window and I grab my camera. I click to capture the moment and return to my writing. With my mind and emotions wrapped up in so much lately, I finally feel my soul return to its rightful place. The uneasiness began last week with a phone call. It was a peaceful day, we were enjoying the sunshine, the newness of spring and Bob’s cancer wasn’t in our thoughts. My husband doesn’t let it define him and as I walk this journey beside him I won’t let it define me either. We go on, not thinking much about it, finding joy in the simple things. Then reality breaks through and we must face it once again. Bob’s cell phone rang while we were having lunch at a small cafe. “The Leukemia markers have increased a little in your blood,” came the words over the phone. I study Bob’s expression, watch him for a few days. He remains strong, steadfast (at least outwardly) and is hopeful that the markers will go down again, if not with the medication he’s taking now, then with another one. My heart and prayers surround him and if there’s any way to test the oneness in marriage and to experience it at a deeper level it’s in times like this. So together we wait, pray and wonder. This past year has been like a roller coaster ride through the steep upward climbs and the wild racing down and then back up through the twists and turns of this crazy journey of medical tests and doctor visits. After the latest blood test results, the what ifs, the uncertainty, fearful thoughts, the all-consuming questions race through me. I get stuck there for a couple of days. But today I grabbed my pen, my journal and a hot cup of coffee. Here I sit writing my prayers, my thoughts, my dreams for me; for us. One by one I write out the gifts that I’ve been given in life. Not just the big ones like God, faith, family, friends, provision…those are obviously important but I’m recalling and writing down the little things today. I’m focusing on all those small miracles that we often overlook and how in the overlooking we forfeit great joy. It’s the simple pleasures in life that surprise us with the greatest joy. So my focus shifts from the what ifs and fearful thoughts to being present in the moment and enjoying the gifts God has for me today…a gentle breeze blowing through an open window, waking up to the orioles singing on my deck, spring flowers popping up all over my yard, the patter of rain on my rooftop, the sunshine poking through tree branches after the rain, barren branches finally sprouting leaves, the smell of coffee brewing and sugar cookies baking, the wonder in a child’s eyes, a child’s laughter, singing, praying, the sunsets… and on and on the list goes. And when we give thanks for all the little pleasures surrounding us our eyes open to glimpses of God’s glory everywhere. Even in the midst of this crazy, mixed up, messy, often painful world there is beauty and grace that moves us into thankfulness and being thankful produces joy. We can’t give thanks and be fearful, angry or miserable at the same time. A thankful heart doesn’t have room for that. Daily we need to find those peaceful places where our bodies, minds, souls can rest. At least I do. I’m an introvert. I thrive and recharge by being alone. There’s been a flurry of activity surrounding my life lately and unless I can escape into moments of solitude I’m a wreck and when I’m a wreck I can’t fully be there for my loved ones and those I deeply care about. 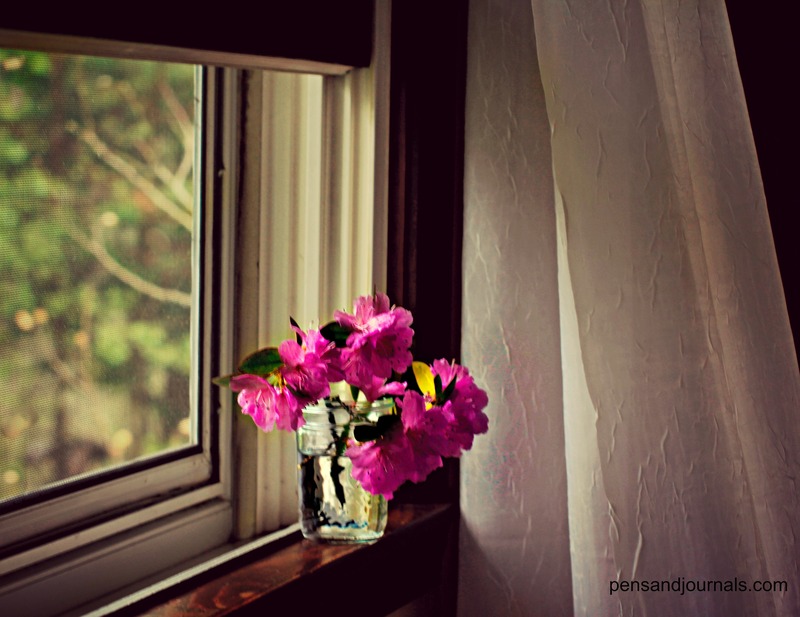 This introvert finds solace and peace through being alone with her thoughts, her God and her journal. I not only find peace as my pen drips ink into words on journal pages, I’m also drawn to give thanks through savoring moments with a click of my camera. Whether I’m recording through words or photos, I’m drawn into the presence and wonder of God and, for me, that has become an act of worship. Nancy, I’m so happy you have written again. Your gifts are gifts to us that read your writings and see your beautiful pictures and we get so much enjoyment out of them. Your insights and being able to put them on paper is very meaningful to us…we can identify with so much of what you write. It was great spending time with you and Bob last night. You are in our prayers. Blessings to you both. It was great to spend time with you and Tom too, Bonnie. It’s always a pleasure. Thank you for reading my ramblings 🙂 and for your continued encouragement. Thank you for sharing this beautiful entry today Nancy! Psalm 28:7 is just the scripture I needed to read this morning & ties in beautifully with my own personal prayer time. I am still praying for Bob & you. We serve a God that is much bigger than any storm that we may go through! Thank you for using the gifts that the good Lord has given you to encourage others! God is good. Thanks so much for your prayers and encouragement, Judy! Nice title, Nancy. I know how great it feels to capture a bird before they fly away. Beautiful photo of a sweet, colorful bird. Keep the faith, sister. Our God is faithful and our healer. Hugs! Beautiful, Nancy. As a fellow introvert, I relate. My peace comes in stealing away with Him, in those little joys. Prayers and blessings, friend. It seems most writers are introverts. It’s great to connect with kindred spirits. Prayers and blessings to you too, friend! Nancy, I know the struggles you’re going through. My husband has prostate cancer and its a real waiting game. It’s always in the back of our minds, even though we know our Lord is with us. We feel blessed that we have this time in our retirement years to express things to one another that we may have not had the words for before. Our love has continued to grow in our 50 year marriage because we share a common faith. I will pray for you and your husband and sincerely appreciate your encouraging posts. It sure is a waiting game and our life has changed dramatically but in the midst of it all there is growth and blessings too. God is good. Thank you so much for your encouragement and prayers. I will pray for you and your husband too. God Bless! Bob has an amazing wife and an amazing God! Praying for you both, Nancy. I am so thankful for your words and honesty. Truly gratitude itself is a gift from God. Oh how He loves us completely. His love is truly amazing! Thank you for your prayers and encouragement. Beautiful post…some sadness, but much sweetness too. Life is good in the littlest moments. May both of you be blessed! Thank you so much. Yes, there’s always special moments and much to be thankful for. God bless! So very beautiful. Your writing is like music. Thank you so much, Jane! That’s such an encouragement to me. Thank you so much, Sally. Your words touch my heart and I really appreciate your prayers. Blessings! Our thoughts and well wishes are with you and Bob. Hope all will be well. Thank you so much Joan. Bob is feeling well and looking good so we’re hoping that the Leukemia markers are decreasing again. Nancy, thanks for the words of encouragement. I can so relate. My husband and I both continue on the roller coaster experience of life with medical drama. God is so faithful and good – thanks be to Him that we can also find joy in the simplest of things. And know that He is in control. Blessings. I love the Oriole photo! Simple pleasures are truly the best. God bless you and your husband as you find joy in the simple things. May His presence go with you and before you on your medical journey. He is faithful. Thank you for reading and for your comment. God Bless!